Several months ago, I told you all about my love of Vines – little six-second videos that can record a cool moment in time without dragging things out. Now, the Daily Item found a local Vine celebrity who uses his creativity to create some amazing videos and hopefully launch an illustration career. He started making the six-second clips and posting them at vine.co/mikebennett in September and quickly made a splash in Twitter-sphere with his family-friendly videos featuring his unique cartoon characters. Within a few short months, Bennett’s work has him ranked 2,207 out of 40 million users on Vine according to rankzoo.com based on the number of followers who regularly check out his work. On Tuesday, I got to witness a church steepl flying through the air, as you can see from the photo there. It was the new Pius X steeple in Selinsgrove. 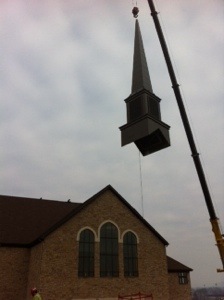 The previous steeple had been ripped apart in a storm in July, and this week the new steeple finally went up! It was pretty cool – I think it’s hard to imagine how these kinds of things are built when you don’t see them being done -steeples are such big, towering things, we kind of assume they’ve just always been on top of the building. So anyway, we got to witness the crane lift the new steeple on top of the building, but before that, we got a look up inside of the new steeple. 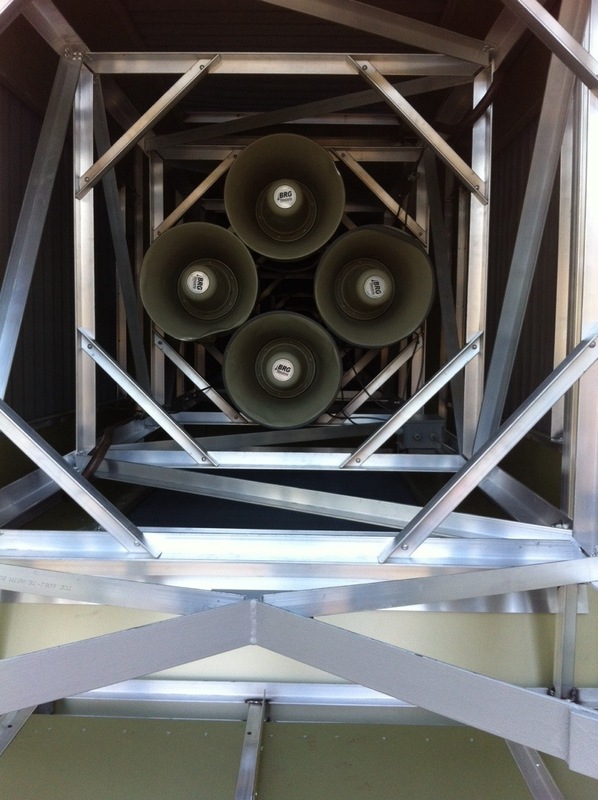 The old church bells have been replaced with speakers, but that’s fine in my book. Whatever makes it easier for them. 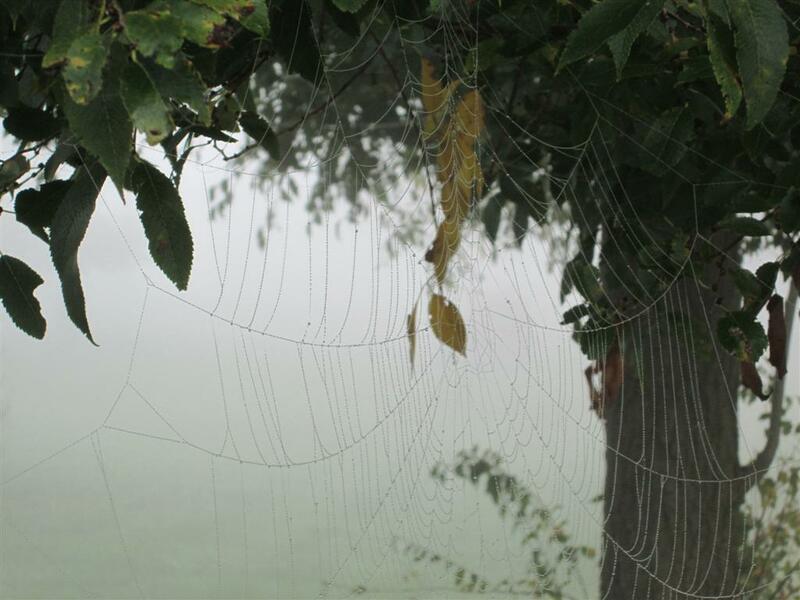 I’ve opined on this blog my fascination with the fog that continues to creep up here, especially at this time of year. And apparently I’m not the only one that feels that way. Now, I hate spiders, but I do like these photos. 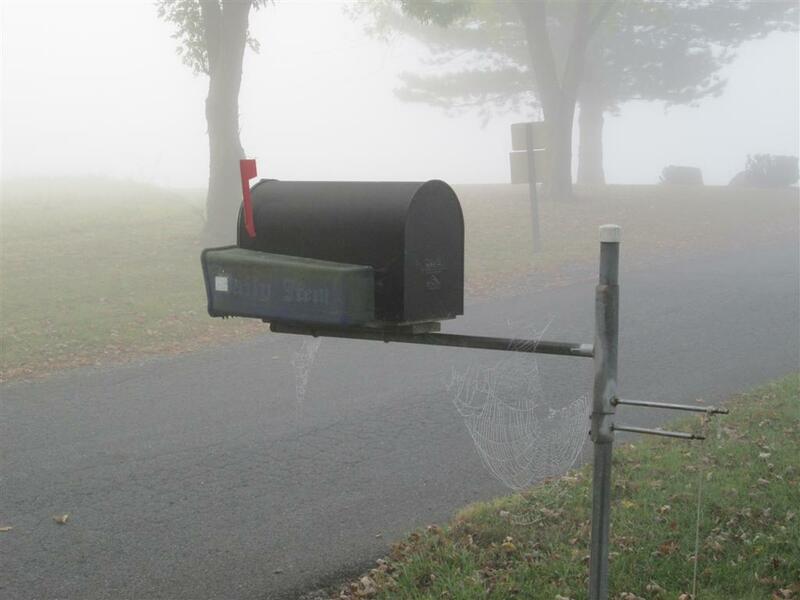 The fog and the spider combination seems to make for a nice, creepy Halloween atmosphere. When I left for college, things were simpler than they are now. We maybe took some photos, but the ones we did were just for use on your flip phone – nothing major. Now with social media the photos you take of your parents lugging boxes up the stairs are meant for public consumption on Facebook, Twitter and Instagram and colleges are taking notice and encouraging students to share. Which is actually a pretty smart thing to do since it gives prospective students a behind-the-scenes look at your institution. Like I said, this seems like a cool way to connect with new students and showcase a right-of-passage for new students to prospective students in a way that reaches them on their terms. I’ll be monitoring the hashtag to see how it turns out! Have you noticed other cases like this? What are other schools doing? In these last days of summer, I seem to be continually amazed by how young people are giving back to their communities. Earlier, I told you about the Union County libraries event, and yesterday I got to talk to Devon Blair, who ran nearly 24 miles for the Wounded Warrior Project – even though he doesn’t really like running. He’s 17 and from Selisngrove and completed the first run last year as part of his graduation project requirements. 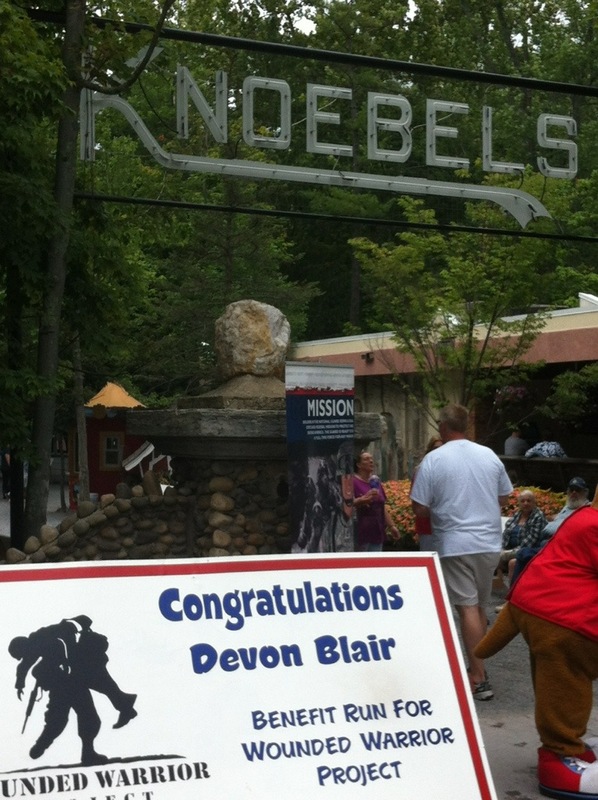 Devon said that he realizes how special and important the Wounded Warrior Project is and he simply wanted to give back. And, he said., if running 24 miles is the best way to do that and draw attention to the cause, he will continue to do that. Devon was also joined by about 5 friends and family members, including his father. All of them should be commended for their efforts to run and raise money for a good cause. 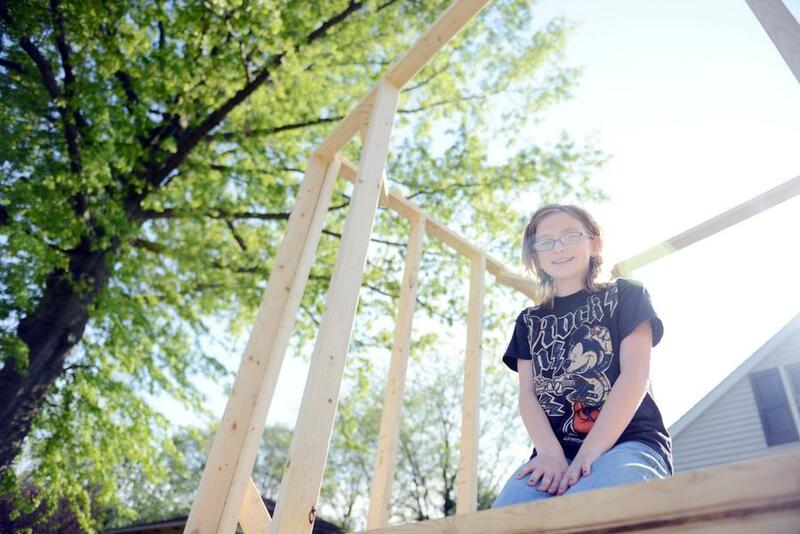 Samantha Carlson, of Selinsgrove, sits in a partially built tree house outside her home that her father began building for her as a gift for her 11th birthday. The Selinsgrove Zoning Hearing Board on Thursday night said the structure must come down. 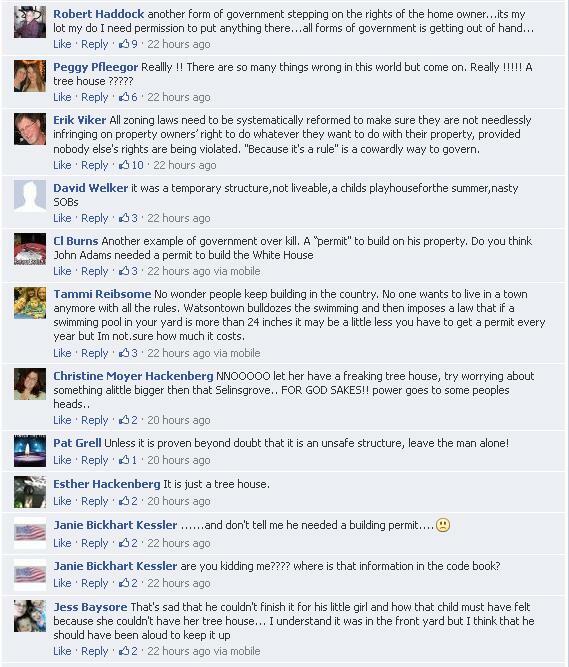 A couple weeks ago, I shared some reaction to the story about a girl and her treehouse – and the borough codes office. John “J.C.” Carlson was preparing to finish building a tree house for his daughter, Samantha, last Saturday when he received a notice from the borough zoning office informing him the structure is illegal. He began building the eight-foot, by six-foot wood structure on a tree stump in the front yard of his 701 W. Spruce St. home a few weeks ago for his daughter’s 11th birthday. Carlson didn’t give zoning regulations a second thought when he began construction. Carlson’s tree house violates the zoning ordinance because it is located on his front lawn on a lot that doesn’t accommodate its large size, said deputy zoning officer Janet Powers. I wrote that social media reaction took off like a rocket. And after a zoning hearing last night which solidified the borough’s decision to make the family knock down the treehouse, the debate is still going strong. Make sure you read the latest here – and then go to our Facebook page to add in your thoughts. I’ll be curious to see where this ends up. It could have the wings to make it a big issue. One of the stories that has really captured the public’s attention this week is the story of a little girl her treehouse in Selinsgrove. When that story hit social media, it really took off, with people overwhelmingly on the side of the family wanting to build the treehouse. It appears the borough is going to be receiving some phone calls and letters now that this story has gotten out. I understand both sides of the issue: You have to enforce laws uniformly, no matter what a person’s intentions are. You can’t make exceptions for one person then refuse to help another. But it’s really hard to stand up against a little girl and her treehouse. It’s going to be unpopular, no matter what she wants – which is, after all, only a treehouse. What do you think about this situation? Which side are you on?